56 O.T.U. was formed at Milfield on 14 December 1944 from I Tactical Exer cise Unit at Tealing which had previously been 56 O.T.U. - a Hurricane O.T.U. at Tealing. 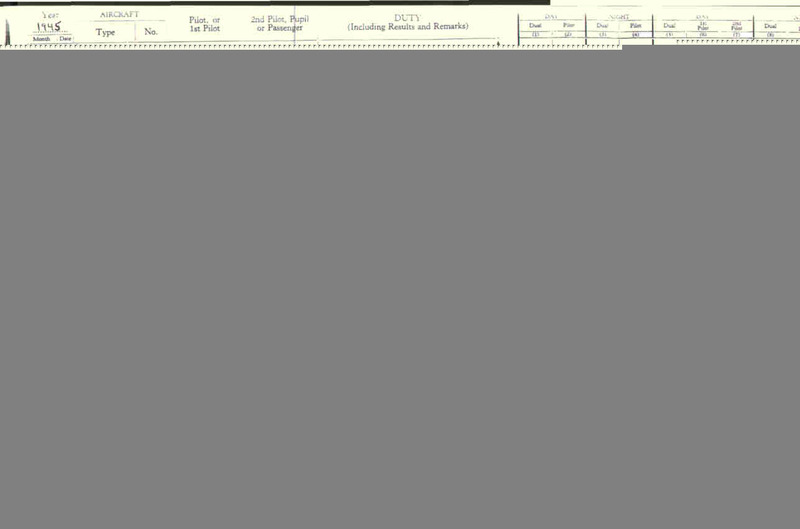 The syllabus was adapted from the Spitfire syllabus for use by Typhoon/Tempest. One of the problems with this reformation of the O.T.U. was the posting in of staff who were both new to instructing and to the Tempest aircraft. Courses were very much the same as other O.T.U. of the same period. Courses were nine weeks duration, three courses to run concurrently with an output of ten Tempest qualified pilots every three weeks to replace pilot losses in 2nd TAF supporting the Allied Armies in N.W. Germany and the low countries. 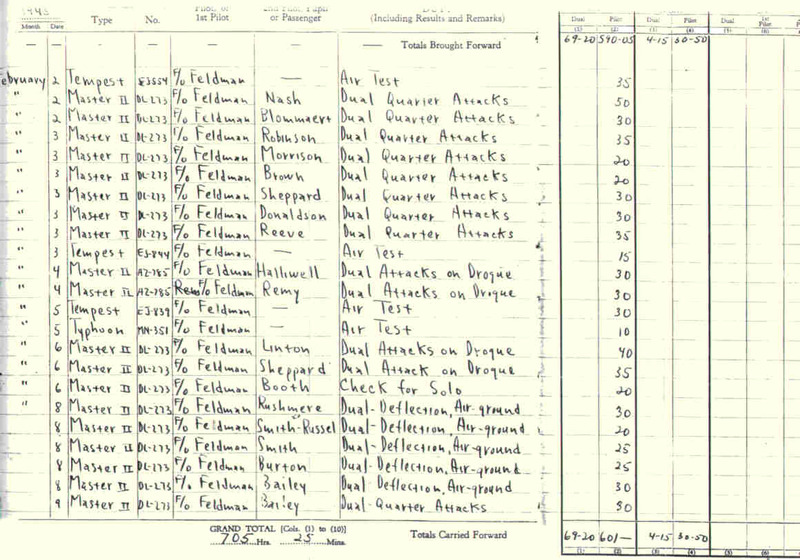 I am indebted to Seymour B. Fieldmann, another who answered my questions of Milfield, who as a Flight Lieutenant, Royal Air Force served with 56 O.T.U. for a few months while resting between tours. An American volunteer, he served with the Royal Air Force from 1941-1948. While with 222 Squadron at Newchurch, flying the Tempest, he shot down 11, V I flying bombs and more than once brought back his aircraft blackened by explosions at too close a range. He was awarded the D. F. C. in July 1944. "I was posted into 56 O.T.U. Milfield early January 45 from 222 Sqd. Newchurch. Kent. And being a qualified gunnery instructor, my duties were to be formation flying, air to air and air to ground firing instruction. 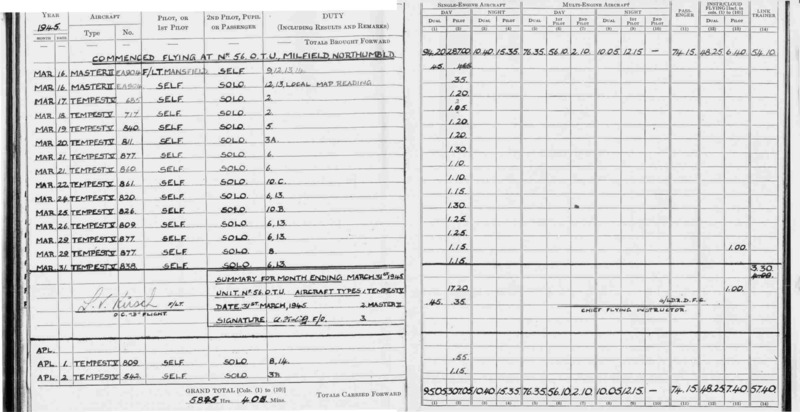 My log book shows 10 minutes local flying followed by a Typhoon air test on the 15 Jan 45. Formation flying and cannon shooting at Goswick and South Buoy ranges near the Holy Island followed during my time with 56 O.T.U. up to my posting to 274 Sqd. Volkel. Holland. 04 July 45. 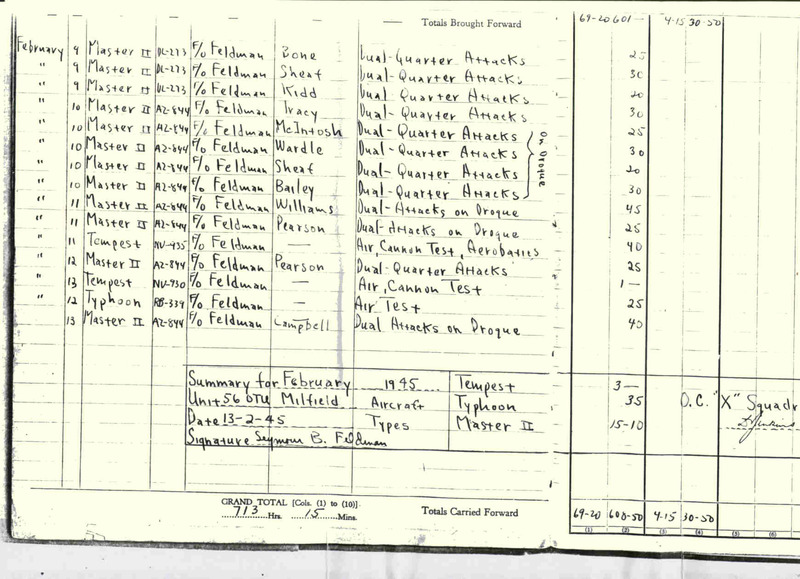 My log book shows 10 minutes local followed by a Typhoon air test on the 15 January 1945. Formation flying and cannon shooting at Goswick and South Buoy ranges, near the Holy Island, followed, during my time with 56 O.T.U ,up to posting to 274 Squadron Volkel, Holland, 4 July 945." F1t Lt Seymour B. Fieldmann chose to remain in the Royal Air Force when most of his countrymen, who had volunteered, were either asked or forced to transfer to the United States Army Air Corps in February 1943 and was repatriated to the United States in 1948. He worked for the Federal Aviation Administration until retirement in the late 1970's. Most of the early students of 56 O.T.U. were of officer status converting to the Typhoon/Tempest and the ground attack aspects of the operation of those aircraft. Despite being of high average flying hours a large number of flying accidents occurred during 56 O.T.U. 's 14 months at Milfield. In May 1999, I was fortunate to make contact with Mr A.J.Tobitt. and submitted a list of twenty questions. Anthony, a former Royal Air Force Flight Lieutenant who had converted to the Tempest at 56 O.T.U. in the last two months of the war, then going on to serve with 80 Sqd in 122 Wing 2nd Tactical Air Force Copenhagen. With his permission, I will include a brief history and his comments of his Royal Air Force period. Born in 1924, he was 15 years old when war was declared in 1939, living with his parents near the Essex/Suffolk border, his Father was a road surveyor with Essex County Council, and as such, was responsible for the upkeep of the local rural highways, during the school holidays he would often accompany his Father and during these excursions he observed the increasing development of airfields in the county, earlier, he had been a boy scout and had attended the 1937 Scout Jamborie in Holland, during this camp they were often over flown by civilian DC 3 aircraft carrying sightseers, circling the camp, before making off elsewhere, he thought how exciting it would be to fly - even as a passenger. Then in 1938, in Denmark, he stayed, after another scout camp, with a Danish boy scout, who`s father was a Colonel in the Danish Air Force, and while there was taken to a local flying display, another boost to his flying interest, over the next few years - the early years of the war, this interest was fed by all the local developments, airfields and aircraft being predominant, and in 1941, when he was seventeen, the Air Ministry sponsored the University Short Course, a six month course, designed to cater for the fit and academically sound and who, after school were likely to go on to University, after interview, if selected, they would become members of the University Air Squadron, where they would undertake the Initial Training syllabus, alongside the course work for their chosen degree. A really crammed six months, fees paid by Air Ministry and with the expectation that after the war, they would complete their degree, but at their own expense. Anthony applied, was accepted and after a successful interview, was granted a place at Oxford, with the course starting in April 1942. Like so many of the young men of that era, their boyhood interest grew from those few, small contacts with aircraft and the appreciation that so many other schoolboys had the same desire, would have to work hard to attain the standards required by the Royal Air Force, would have to have a large slice of luck if the were to find a place in the training system, as Anthony said, " the obstacles, delays and frustrations, and in the end the disappointments for some, simply made the` getting there` more desirable. And when you did get there you were keen to do your best and be proud of your achievement". April 1942. Oxford. (University Air Squadron). Nov 1943. 11 E.F.T.S. Perth. Scotland. (Flying Grading School - "Tiger Moths" - 1st Solo). Jan 1943. Canada. P.D.C. Moncton. New Brunswick. Feb 1943. 34 E.F.T.S. Assinaboia, Saskatchewan. ("Tiger Moths"). April 1943. 35 S.F.T.S., Battlefield, Saskatchewan. ("Oxfords"), awarded his wings. Sept 1943. 3 Flying Instructors School. Ontario. ("Cornells"), "C" cat instructor. Nov 1943 33 E.F.T.S. Caron, Nr Moosejaw. Saskatchewan, ("Cornells"). 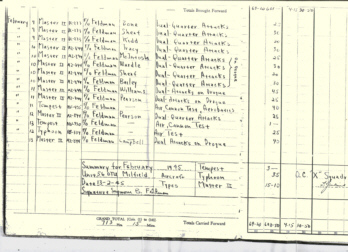 Jan 1944. returned to the U.K. when 33 E.F.T.S. closed down. Feb 1944 P.D.C. at Harrogate. Seconded to Air Traffic Control duties at Royal Air Force Little Snoring. Norfolk. (100 Group Bomber Command - " Mosquitoes"). Oct 1944. 7(P) A.F.U. Peterborough. (" Masters"). Dec 1944. 11(P) A.F.U. Calveley. ("Masters and Hurricans"). June 1945. 83 G.S.U. Dunsfold. Surrey. ("Tempests"). Aug 1945. 80 Sqd, 122 Wing, 2nd T.A.F. Copenhagen, then Lubeck. Germany. ("Tempests"). Feb 1946. Royal Air Force Fair Oaks. Surrey, "B" cat instructor. Oct 1946 Demobilised. Tobitt. A.J. Flt Lt. 153033. There were other , Anthony said " incidental" postings, such as Instrument flying and a Beam Approach course, we should appreciate that, at this time in the second world war, the sophistication of single seat aircraft was immense, in that,	at the time of the Battle of Britain, the fighter aircraft were then under basic control and directed by teams of radar assisted controllers, who directed whole squadrons to the area of large formations of enemy aircraft, after the air battles, the aircraft would be dispersed from their formations, and often, would return as single aircraft to their own airfield, or to any other airfield that their condition or weather conditions dictated. Anthony`s, "incidental" Instrument and Blind Approach course, was at No 1 Blind Approach School. Watchfield, then in the county of Berkshire. 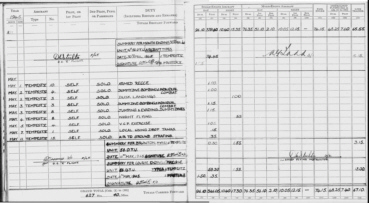 a new syllabus had been introduced on 30 August 1944 to the (P)Advanced Flying Schools whereby the pilots of single engined aircraft taught to fly by instruments and in cloud conditions, full cross country exercise flights, Q.D.M`s, where the controller will advise magnetic headings for the pilot to steer to arrive at a specific objective or to arrive at the airfield, and blind approaches to the runway, not an easy task in a high performance, single engined, single seater aircraft. But one posting he recalled was a P.T course at the un-completed holiday camp at Filey, (later to become Butlins), apart from the concrete footpaths, the place was a sea of mud, whilst the concrete chalets in which they slept, had little or no heating and doing P.T on the grass with the snow blowing in off the North Sea was not a joyous occasion, and really finished him for holiday camps. 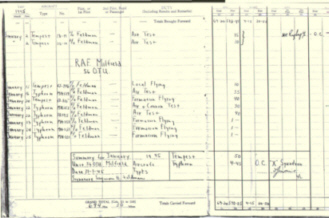 Anthony`s reply to a list of questions I put to him, about his nine weeks on Course No 4a, the Tempest conversion course, at Royal Air Force Milfield from 13 March to 15 May 1945,were, considering fifty four years had passed, most helpful and really did give a flavour of the period. Having arrived at Newcastle from Crewe. He, with others was transported to Milfield in a 3 ton truck and on reporting to the guard room was allocated his billet, which was on main site, alongside the Wooler - Milfield road. The twenty two above were first divided into flights and then allocated their instructors, half would be in the classroom while the other half would be flying and vice versa, by the half day. The first few days would be spent flying in the local area, first, in the Miles Master and then converting to the Hurrican before converting to the Tempest, for those who had already converted to the Hurricane, as Anthony had at Calveley, it was Masters then onto the Tempest, he said, " As I sat in my first Tempest, at the end of the runway at Milfield, waiting for the green light from the airfield control pilot, in the caravan at the runway edge. With a four bladed propeller of about fourteen foot diameter, in fine pitch, driven by 2,400 hp under the bonnet, the potential can be quite alarming to a novice. As far as I can recall, I managed to make a reasonably straight take off run and surveyed the "Cheviot" disappearing under my starboard wing, as I climbed away to port. It was a great moment, whilst "Tempest" take offs remained occasions, which never failed to give me something of a buzz. I think this was in part due to the need to commence the take off run with full port rudder on, to counter the torque of the propeller, as speed was increased the rudder could then be progressively reduced as it became more effective. "Yes", the Tempest was quite a potent animal ! " Bearing in mind that the war against Germany was almost over, the likelihood was that those pilots trained ready for squadrons were, that they would go on to see out the war against the Japanese, at 56 O.T.U. they were still working a six day week and if inclement weather, a seven day week. 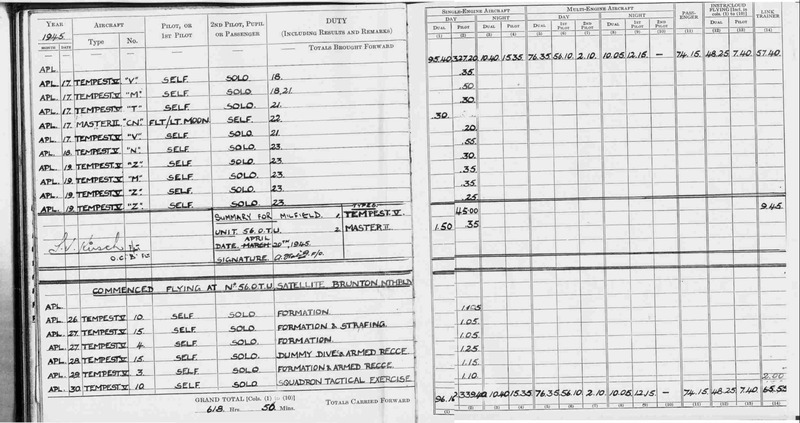 The table above shows average pilot hours and practices and course totals for guns fired, simulated or actual, At 56 O.T.U., on the technical site, the cine gun camera film was self-evaluated by the pilots on course, on a machine that gave an assessment of the probable hits, also on the technical site there were various other simulation devices. A dummy aircraft cockpit in a room painted to represent a sky panorama and aircraft models suspended or moving across the pilots field of view, a hunt and range trainer to simulate sky, sea and a beach target, the Link Trainer and an R.T. trainer. On each course a mobile de-compression chamber visited Milfield for two days, and pupils were decompressed, on each course a visit to the public baths in Edinburgh for Dinghy drill took place. The Escape and Evasion drill phase on this course, 5a, was held at Royal Air Force Brunton, (Milfield`s satellite airfield), and was re-scheduled for the Pacific area of operations. Other than the above, 56 O.T.U. training followed the usual syllabus, with individual training sorties working up through pairs, flights to squadron exercises. Anthony recalls one flight in battle formation i.e. an instructor leading, Anthony as his number two, an instructor number three and another student in the number four slot. They were flying in the Milfield sector, about four miles East of Edinburgh, when the leader decided to make a simulated rocket attack on a lighthouse in the vicinity, this was Anthony`s first experience of this type of attack, they moved into echelon Port, passing the target on their left, the leader then rolled right through 270 degrees down towards the target, with the rest of us following. At this point he remembers glancing at his air speed indicator, which was around 450 m.p.h., and rising fast, and realized there was another "Tempest" just behind him, nibbling at his tail wheel, just as he was, the one IN front." We were in fact all too close", it made him sweat a bit but by that time he was pulling out and spreading out in The climb, just another example of it being a first time for every thing, with increased experience leading to enhanced confidence but hopefully not over confidence, and carelessness. The instructors within the formation were able to observe the students progress throughout the training sortie, often an instructor would shadow paired students flying a particular exercise, such as a simulated sector reconnaissance or cross country navigation exercise. Another recollection, by Anthony, was of Milfields pigeons, not that they were of a flying menace particularly, but that due to their profusion, they appeared in the mess in many, too many guises, as Roast Pigeon, Cold Pigeon, Pigeons Pie, pigeon camouflaged as something else, the diet went on relentlessly, he says, he had never eaten pigeon before he went to Milfield, but he has never eaten it since ! The other questions that I asked Anthony, have been incorporated in the additions to the towed target section previously shown. I was able to pass on to him copies of his performance while he was at 56 O.T.U. and on course 4a, as these records are Air Ministry property I cannot reproduce them here, but have been able to make comment, there was one pilot killed on course, one courts martial of a Commonwealth pilot, resulting in him being re-coursed at a later date, and one being re-coursed due to sickness. Then in late 1997 a sad letter arrived from a retired Police Constable living in Glasgow, asking for a copy of "Milfield, not just an airfield….." and saying that his Uncle had served at Milfield and that while on a course there, had been killed, and was it mentioned in the booklet, as his family knew little of how or where the Uncle had served before being killed, letters flowed back and forth and I was asked if I would undertake to build a history of his Uncles wartime service life from the few details contained within the crash report and his record of service document. Frank and George Ford, two brothers, had decided that when they went to war, it would for preference, be in the Royal Air Force, and if at all possible as aircrew. it was not un-common for one brother to follow the other into the same service and for one to try and out do the other. Frank, the older of the brothers, enlisted in the first year of the war and all of his training to become an air gunner, for that was what he was selected to become, was conducted in Great Britain, after initial training he moved onto Air Gunner training at Stormy Down, South Wales. then onto 15 Operational Training Unit, (15 O.T.U.) on Wellington twin engine bombers, later going onto a squadron as a rear gunner, he flew several operations before becoming non-operational and posted to the Aircrew Reselection Centre at Eastchurch, in Kent. Younger brother George enlisted in the Royal Air Force at Edinburgh.25.03 41. L.A.C. (leading aircraftman) Ford.G.W.R. service number 1345592.Posted to Aircrew Reception Centre. Grove Court. London. selected for Pilot training and posted to I.T.W. (initial training wing) Torquay. During this training he was accepted for the Arnold Scheme, (a story in its own right) for training in the U.S.A. course No 42 e. Sailed from Gourock to Halifax, Nova Scotia and onto Toronto by train, discharged from the Royal Air Force, and a civilian visa issued for training in the U.S.A. with schooling in Alabama, his basic and advanced flying training was conducted by the Van de Graff flight training school at Tuscaloosa, Maxwell, Gunter and Craig Field, following his successful completion of flying training he was awarded the American Army Air Corps silver wings, but having trained in the clear skies, both day and night, of Southern America, on his return to the U.K. on 12.06. 42, now a temporary Sergeant, he would have to under go further training to be able to cope with European weather. Royal Air Force. Cranwell. 30.06.43. Promoted to Flying Officer 08.08.44. Royal Air Force. Seighford. 13.02.45. 21 (P) A.F.U. Oxfords. Royal Air Force. Calveley. 28.02.45. 11 (P) A.F.U. Hurricanes & Harvards Recat course as Flying Officer `B` category to A2 category. Royal Air Force. Milfield. 03.03.45. 56 O.T.U. (Operational Training Unit) No 4 Course. 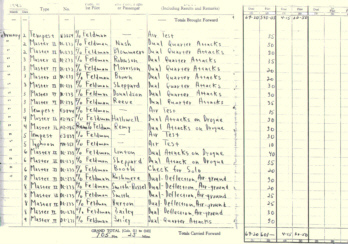 Input of 44 students for conversion to the Hawker Typhoon, (22 students) , Hawker Tempest, (22 students), the students were of mixed ability and had varied experience on single engined aircraft, the courses were of nine to ten weeks, depending on the weather factor, with courses overlapping to provide an output of ten Typhoon and ten Tempest pilots every ten weeks, the Typhoon and Tempest aircraft were a huge change in size, power and performance, almost twice as powerful as any aircraft the students would have flown up until this course. The Tempest being regarded as the fastest single piston engined fighter in the world at that time, early 1945. 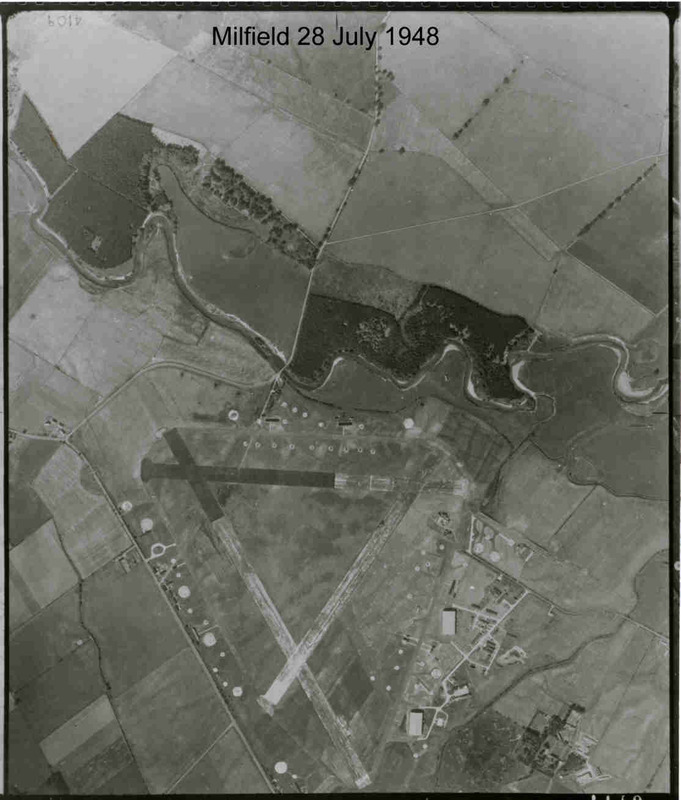 The course content, was to convert the student, in F/O Fords case, to the Tempest aircraft and improving the single pilot operating skills, then working up to operating the aircraft in pairs, then flights, (four aircraft) in the local airfield area, then in the sector area, from Newcastle to North of Edinburgh, before going onto air to air, simulated and live weapons firing at towed targets, live air to ground firing, use of rockets and some bombing on the ranges at Goswick close to the Holy Island, that were specific to Milfield. Flying Officer G.W.R.Ford. had progressed from a "C" category instructor, in 25.08.42. through "B" category in 1943 and 1944 to an "A2" category instructor by 28.02.45, he had a large number of flying hours in command of aircraft, mostly single engine training aircraft with the student doing at least half of the flying, and I would assume, a few hours in Hurricane fighters, that were at three of the units he instructed at, in the two years before beginning this course. It would appear from the time elapsed on the course that he had progressed almost to the " flights of four aircraft " stage of the course. F/O G.W.R.Ford. 173342, killed 13 April 45, at 15:40 Tempest V EJ 542 at Lamberton Moor, North of Berwick upon Tweed. QU 455796. 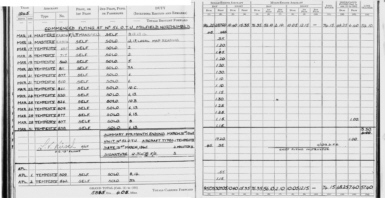 On low level cross country navigational exercise from Milfield, encountered sea fog, turned 180 degrees, (inland) flew into high ground,(720 feet) AM form 1180, (crash report) observes. Pilot did not climb before entering cloud, as he had been instructed. My observations of the crash report and his extensive and varied flying experience, would leave me to imagine, that he might well, on finding himself in cloud/sea fog, have turned back towards the land, on instruments, with the expectation of regaining visual flight over country, that is predominantly flat in that immediate area of the North East coast, and to be able to continue his briefed low level cross country, without, as briefed, first climbing into the clear sky above the sea fog, turning and regaining sight of the ground before letting down in the clear to regain his height and track. This is assuming that the briefed low level area was as others have stated, the Edinburgh sector. I imagine more a matter of pride in getting the task done, although as already said, he was new to this high performance fighter but would have been eager to move on to this aircraft, maybe his ability was over estimated, by the checking instructors on the course. What ever, his enthusiasm, at that stage of the war, was not in doubt. And, as has been evident in the other examples I have been permitted to quote, the keenness and diligent attitude of these young men, going from course to course, at different locations, most of which they had never heard of, let alone traveled to, sometimes in foreign lands only recalled from their school atlases, was all personal high pressure and their attitude was remarkable and to be applauded. Frank Ford junior, as I said earlier, is a retired Glasgow Policeman and when in the police service one of his last jobs was at Lockerbie, at the crash scene of the Pan Am, flight 103, Boeing 747 bombing, which had a severe effect upon him, and which started him thinking of his Uncle George`s crash and wondering why, when his Father was alive, he had said little of his short operational flying and why was he re-mustered to other duties. 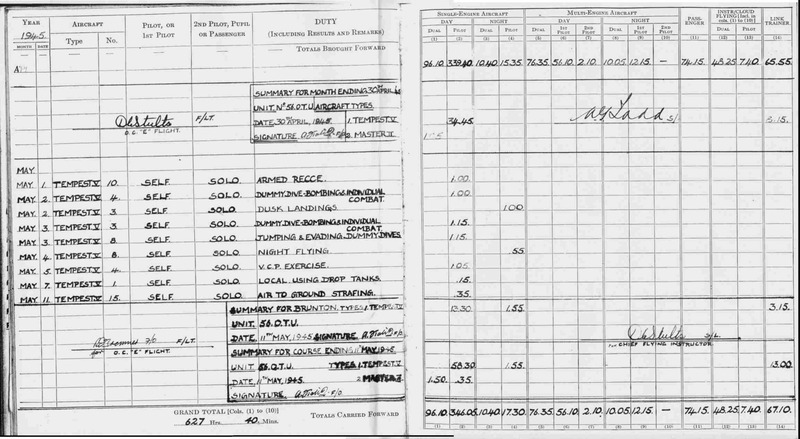 On asking his Mother he was told, "Dad did`nt like to talk about his flying", there was a time when F/O Ford`s flying log book, impounded for the crash inquiry, would have been available to the family, but it was never claimed and so was lost in the 1960 log book purge, when all but the most unusual or most descriptive log books were destroyed, due to lack of storage space. 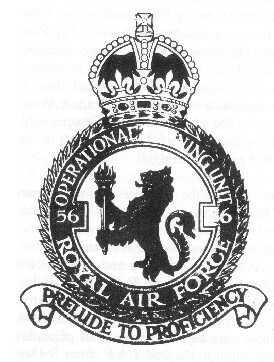 The Wing Commander Training`s end of course report makes good reading and reflects most favorably on the course members and that "keenness and pride" that Anthony Tobitt referred to earlier. Especially when you consider that the war against Germany was all but completed and the sights were set on the Far East, far away from home. PASSING OUT REPORT COURSE No 4 a & b. No 4 Course was keen to fly and maintained a high standard of discipline. Their formation was good from the start and they reached average standard as a course. There were eight accidents on the course 6 unavoidable, one through failure to carry out briefing instructions and one due to bad weather. All exercises were carried out satisfactorily according to the syllabus. As in previous courses, they had difficulty keeping station at first, but passed out with a good average standard. The method of take off and landing was the same as that used on previous courses and was equally successful. The course completed the full Navigation Syllabus of Synthetic Training and Flying Exercises with a final average of 8.35 hours. 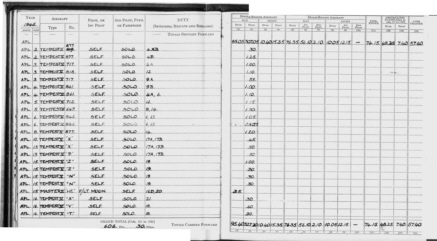 Their pre-flight planning and map reading was of an average standard. Pin-pointing and General Navigation from the beginning of their instruction, with the exception of one or two cases, were very satisfactory. The course on the whole showed great keenness and is of an above average assessment. The course was enthusiastic as a whole and their results compare favourably with the previous course. They were at a disadvantage during air to ground firing as the targets were in a bad state of repair and new ones were not completed in time for their use. These new targets are now in use by 5 course and several exceptionally high scores recorded so far point to this being possibly the chief reason for the previous rather low average. 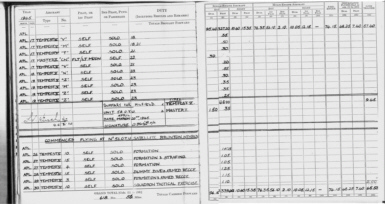 The Gunnery Assessor showed that there was a tendency to fire at long range as is usual especially in the early exercises. Pupils were instructed in the use of the Assessor and encouraged to assess their own films when not flying. Air to Air firing was often carried out in rather hazy conditions, making it very difficult to judge range and positioning correctly. The percentage attendance at lectures of the pupils on the course was 99, a few absences being due to sickness. The average number of hours carried out by each pupil on the Link Trainer was 12 hrs 32 minutes, with a further three hours on other synthetic devices. The standard of discipline on the ground was on the whole satisfactory with one outstanding exception - an Officer who was taken off the course. From the results obtained in the examinations the course was above average in ground subjects - additional lectures were given during bad weather on Escape and Evasion, and the pupils were also given weapons training. No 4 Course compared well with the previous three courses trained at this O.T.U. although they did not pass out with the high standard that was expected from the results of their first two phases. No great difficulties were through lack of equipment, other than that experienced all along, namely, insufficient replacements for engines. The unit disbanded 31 December 1946. 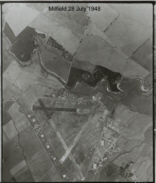 In addition to the three main units that operated at Milfield there was also the Station flight, who's aircraft were used to transport the Station Commander and staff to various locations and maintain staff flying currency and comprised such aircraft as the Tiger Moth, Magister, Oxford, Dominie and Battle. One of the Station flight, pilots, was Jack Clarke of Berwick on Tweed. Who, as a Warrant Officer, was the Unit Test Pilot and flew the aircraft after servicing,modification or, some times. partial re-build. Jack had transferred from the Army in 1941 to the Royal Air Force, in response to the request for the other services to replenish the Battle of Britain losses. Many soldiers responded and became members of the Glider Pilot Regiment. Jack, after training in Canada and Spitfire 0.T.U. back in the U.K., served with 165 Squadron before joining Station flight. where he was expected to fly "anything with wings". At most times Milfield would have more than 100 aircraft dispersed around its perimeter track and when the United States Army Air Corps attended the Air Support Courses of the F.L.S. they would bring their own aircraft to the course. so swelling the numbers to 140-150. And, with only a few exceptions, would take them back to their units. Some of the more notable Officers Commanding Royal Air Force Milfield were: Group Captain J.R. Addams, A.F.C., who's daughter is better known as the film and t.v. actress of the sixties/seventies - Dawn Addams. Group Captain E.M. Donaldson, D.S.O., D.F.C. later to capture the world air speed record for Great Britain. Adjutants: Flight Lieutenant J. Blomley, a director of Sadlers Wells Ballet Company'. Squadron Leader Peter Bingham-Wallis, William Brodie's lifetime friend - a friendship formed in wartime and, one feels, continues on today, side by side in Kirknewton churchyard. 1944. Eighteen squadrons of Typhoons operated in 2nd T.A.F. and two remained	in the U.K. on air defence. Over 600 Typhoon pilots lost their lives in air support operations. I am unable to say how many of those 600 were trained at Milfield but believe a very high percentage passed through there. Robert Hedley of Cheswick Farm, who farmed the land before Goswick range was established and after the range was closed, in 1946, said that one or two people had a little side line of raking up the spent cartridge cases, from the foreshore close to the ranges above which they had been ejected, and selling them at scrap value. During the years that the ranges were in operation they were not allowed to farm or even to cross the ranges to get to the sea for a swim but he well remembers the numbers of aircraft and their diving down to fire rockets or drop bombs almost every day. Goswick, North Buoy, South Buoy and the beach targets, No.59 O.T.U. expended an average of 130,000 rounds of 20mm &.303 ammunition and 1450 rocket projectiles per month. F.L.S. 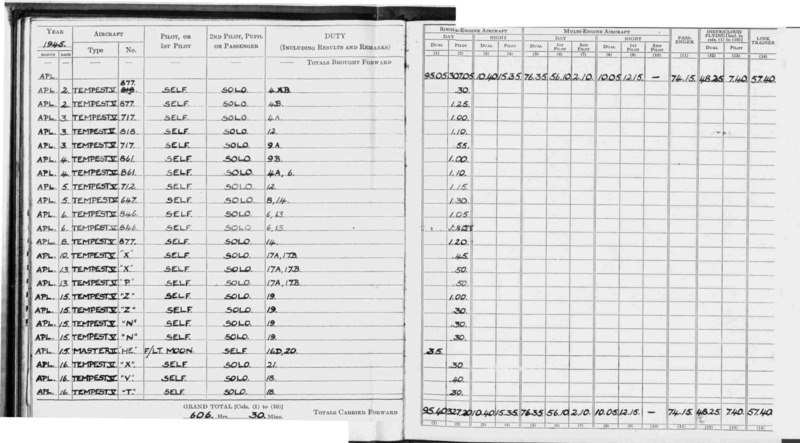 I have not been able to discover tables of ordnance used but would assume that it would be about the same as the O.T.U. 's per course, plus practice bombs up to 500lbs in weight. I can imagine a number of Typhoons overhead, rolling over and cascading down with ever increasing engine noise to launch their rocket projectiles then thundering out to sea, jinking left and right as they climbed back to rejoin formation. But I can't imagine some weeks later being a German and looking up to see the same type of aircraft diving at me, seeing the smoke trails of released rockets and knowing they are aimed at me and there is no escape. The screams, the dust, heat and turmoil, then silence as the lane is blocked from end to end and nothing moves again. This happened many times those first weeks in Normandy after the landing.